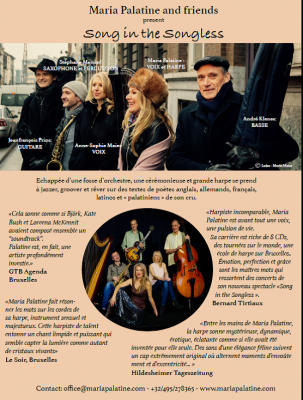 Maria Palatine qui a reçu le « Golden Artistic Award », comme artiste féminine de l’année 2017 à Bruxelles, présente son nouveau spectacle « Song in the Songless » avec des musiciens de la crème de la crème du Jazz belge. 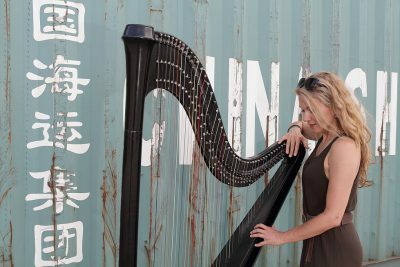 Echappée d’une fosse d’orchestre, une cérémonieuse et grande harpe se prend à jazzer, groover et rêver sur des textes de poètes anglais, allemands, français, latinos et « palatiniens » de son cru. The story of my life could also have the title: “My home is where my harp is”. But the fact that there was a harp in my family was due to my grand-uncle, a painter who, during the National Socialist dictature in Germany, was a deserter and hided in the Alps for several years. Although he never was legal resident during this time he had access to the regional civilisation and learned playing the popular harp. The war being over, he came back to his homeland, the Palatinate in South Western Germany, and passed on his knowledge, as well as his harp, to my mother. It was from her I learned the basics of playing harp as well as singing. My paternal grandmother, who directed a travelling theatre all her life, brought the love for theatre into my family. One of the ancient castles which are spread all over my home region, the Palatina. This may be why already during my studies, and despite of a foreign scholarship and the beginning of my career as a chamber musician, I missed an essential element: the creative combination of singing, playing, dancing, and composing. After my final examination as an orchestra harpist and a half year stay in Venezuela I founded my own ensemble with saxophone and percussions. Our concerts and CD productions took us from Europe to the United States, as well as to Siberia, which was a short but unforgettable journey for us. During our work, which also included multimedia projects, we collaborated with renowned artists like Lokua Kanza, Markus Lüpertz, Bernard Tirtiaux, Galileo, Chiha, and many others.